The Laird of Kincavel gift pack means that the recipient becomes the legal owner of a small plot of land on a feudal estate in Scotland, and can use the word 'Laird' in front of their name. So you can totally Lord it up when booking restaurants, hotels and the like! We can't promise you'll get better treatment, but let's just say - we tried it, and we did... A special, unique and truly unusual gift. 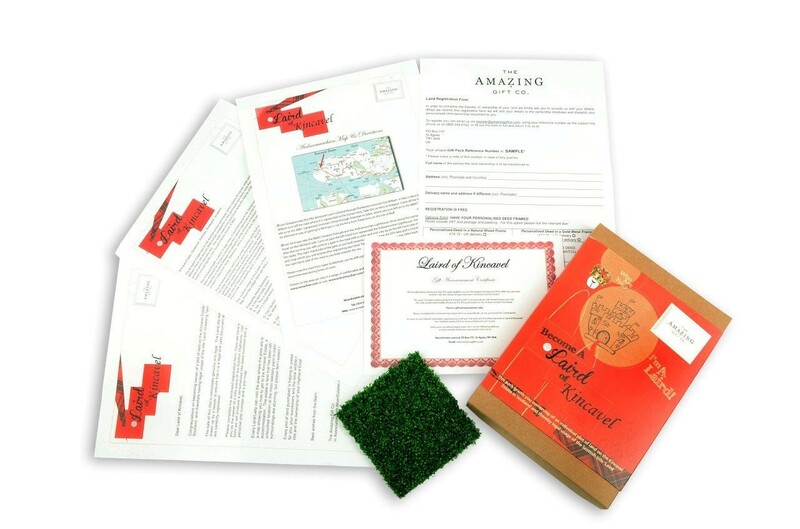 We do not need the name of the new Laird at this stage - just fill out the registration form inside the pack and pop it in the post, email the details, or give us a call with the required information, then we will issue a personalised Land Deed with unique plot number. 1. Is the land really mine? Yes. This is completely genuine and legal. The original Laird title document has been drawn up by a lawyer to ensure that it is a legal and valid document. 2. Can I build on it? No. Whilst the land is yours, it is to be left in its natural state in order to preserve the local countryside and wildlife. 3. Can the land be inherited? Yes. The land can be passed on by informing MoonEstates.com of the changes. 4. Am I now a member of the aristocracy? No. 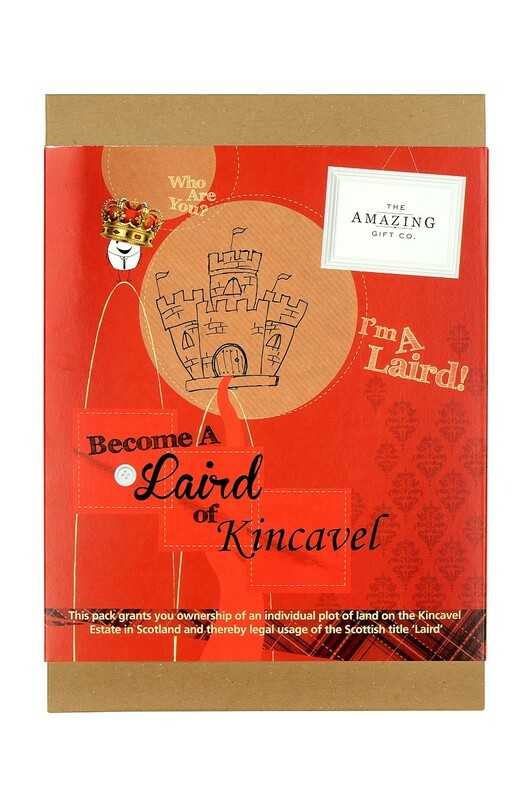 It is virtually impossible to buy a British aristocratic title; ownership of the land does however allow you to use the title "Laird of Kincavel". 5. Can I visit the land? Yes. The land is in a remote location which has been left in its natural state. In order to preserve the natural landscape please note that there are no facilities on site and no signs to the land. The Kincavel estate lies on the Ardnamurchan peninsular, which covers 50 square miles and is due west of Fort William.. There are around 2000 human inhabitants of the peninsular, but many more thousands of creatures and plants, some of which are very rare. The north coast of the peninsular faces the Islands of Muck, Eigg and Rhum, while the south coast runs alongside Loch Sunart and the Sound of Mull. The Kincavel estate is within a large area of land belonging to the Sonachan Hotel, 1000 acres in total - 400 of which have been enclosed by fences to encourage the natural regeneration of the flora and fauna without damage by farm stock. Sonachan is located between the beautiful sandy beaches of Ardnamurchan's north coast and Tobermory the scene for children's television show Balamory, which is a short ferry ride away on the Isle of Mull. The Kincavel Estate itself is just a few hundred yards from a secluded golden sandy beach visitors at some times of the year are likely to find they have it all to themselves! Your land is on a seaward facing hillock and looks out over the sea to the Isle of Mull. On a nice day it is the perfect place for a picnic as there are spectacular views in every direction; across the mountainous countryside inland and over the sea to the Isle of Mull. Nearby attractions include the Ardnamurchan Natural History Centre and Ardnamurchan Point lighthouse. This lighthouse was one of many built by the Stevenson family, and is the only one in the world built in an Egyptian style. Ardnamurchan Point is the most westerly point in mainland Britain a claim often wrongly thought to belong to Land's End in Cornwall. The nearest village to the Estate is Portuaik the most westerly settlement on the mainland, overlooking Sanna Bay. From the village there are also views across to the Isle of Skye and the Small Isles. Visitors to the area can stay in a range of comfortable and welcoming accommodation see the Sonochan Hotel's website at: www.sonachan.com or visit: www.ardnamurchan.com for full details of the area.